You're a get-outside person, which is why you're not about to let a little drizzle get in the way of your weekend spent hiking in the Adirondacks. 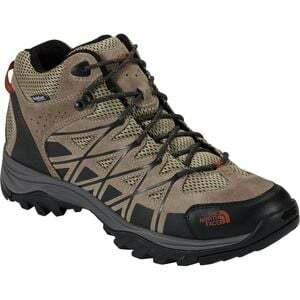 Not to mention, when you have The North Face Men's Storm III Mid Waterproof Hiking Boot on your side, its hard to find an excuse why you shouldn't hit the trails. As its name suggests, the Storm III Mid touts dependable ankle protection that makes it ideal for longer treks, while the suede and mesh upper ensures torsional stability and ample breathability, creating a comfortable climate for your foot. A DWR treatment fends off light moisture, precipitation, and the occasional trail-side puddle.The foam-lined collar and tongue prevents bruising, and the gusseted tongue bolsters defense against water and debris. Meanwhile, the Ortholite footbed and EVA midsole attenuate shock and provide support, and the ESS Snake Plate is designed to safeguard your foot from the protruding rocks and roots you encounter on the trail. Not to mention, the Vibram XS Trek outsole features a lug pattern that delivers traction underfoot in wet or dry conditions.